Tyler Gorman/Staff Photographer BU curated an exhibition that depicts the life and legacy of Glenn G. Bartle Library’s namesake, who was the first president of Harpur College. 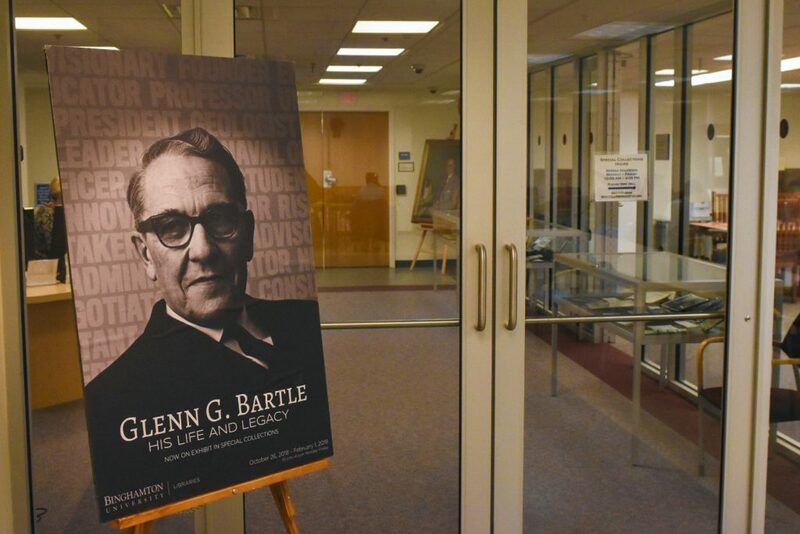 In celebration of the 40th anniversary of the renaming of Binghamton University’s library, Glenn G. Bartle Library curated an exhibition on the life and legacy of the library’s namesake. The exhibition, which was curated by Joe Schill, a graduate student from the University at Buffalo, and Yvonne Deligato, University archivist, opened last semester on Oct. 26. It outlines the biography of Glenn G. Bartle, the first president of Harpur College, and his impact on the University. The exhibition can be found in the Special Collections section of the library alongside an additional exhibition on the development of the library in the North Reading Room. It was created after Bartle’s grandchildren donated three of his diplomas to the University in summer 2018. According to Blythe Roveland-Brenton, head of special collections, the timing provided the opportunity to honor Bartle on the coming anniversary of the renaming of the library. The exhibition traces Bartle’s life from his career as a geologist to his time at the University. Bartle’s master of arts diploma and his dissertation, both of which he earned at Indiana University, are on display. The showcase also includes a medal he earned during his naval career. Additional cases within the exhibition focus on his career as a professor and dean. Bartle, a veteran of both World War I and World War II, came to the city of Binghamton in 1945 to assume the position of the dean of Triple Cities College. He became the first president of the University after the college joined the SUNY system in 1950 and was renamed Harpur College. In 1961, Bartle moved the campus from Endicott to Vestal. Later, Bartle left the University and became a consultant for the U.S. Agency for International Development in Washington, D.C., where he died in 1977. In 1978, the library was renamed in his honor. The exhibition mentions different initiatives Bartle implemented during his time at Harpur College, including the four-credit system for classes and a three-trimester system, which is no longer followed. Harpur College was the only liberal arts college in the SUNY system at the time and according to the exhibition, Bartle modeled the school after Swarthmore College in Swarthmore, Pennsylvania. Roveland-Brenton wrote in an email that she believes Bartle’s achievements and dedication to the growth of Harpur College are what make him relevant to the University today. According to Roveland-Brenton, the second University president, G. Bruce Dearing, spoke at the renaming ceremony citing the importance of naming institutions. The exhibition, which was originally set to close on Feb. 1, has been extended to Feb. 15.